We’ve talked a lot, now it’s time to put the plan into practice. 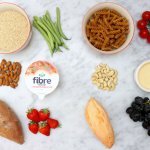 This is one example of how we hit our 30g fibre intake and bridge the gap to keep our diet varied, all with a little help from Arla Fibre! To see how we fit it all into one day, head to our YouTube channel and check out our full ‘day in the life’ video.